Today's economic releases were generally upbeat. No sign of anything that looks like a recession, just more signs of improvement in a variety of areas. June Personal Income came in a bit stronger than expected (+0.5% vs. +0.4%), and it has increased 3.5% over the past year in nominal terms, and 2% in real terms. Government transfer payments accounted for only a small fraction of the June gains, so this is "real" improvement. In the first half of 2012, real personal income is up at a 4.4% annualized rate, which is comfortably higher than its 3.2% average growth rate over the 40 years leading up to the last recession. 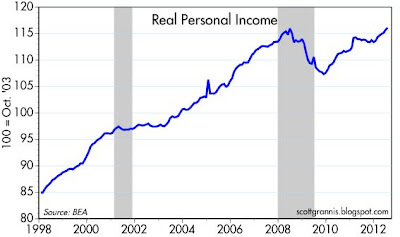 Plus, as the chart above shows, real personal income has now hit a new all-time high. That's one more in a growing list of indicators that now show a full recovery from the devastating 2008-9 recession. 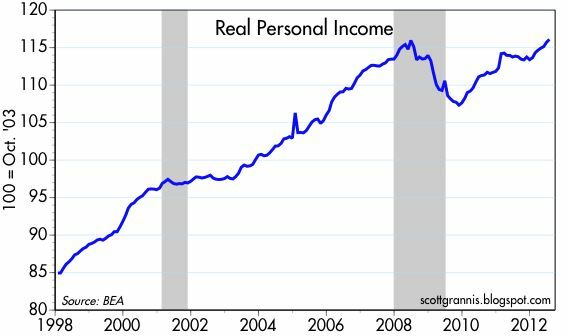 Personal income has traditionally not been a leading indicator, but when it posts numbers like these, it's not to be ignored. 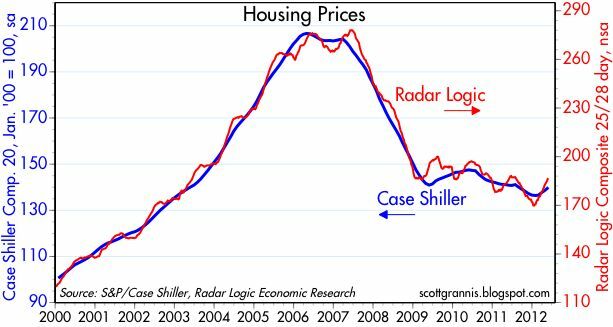 Both the Case Shiller and the Radar Logic housing price indices have registered stronger-than-expected gains in recent months. The Radar Logic index (not seasonally adjusted) is now up 0.3% over the past year, while the seasonally adjust Case Shiller index is down only 0.7%. 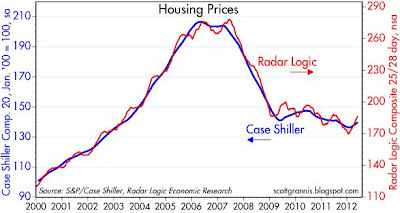 More signs, in other words, that housing prices are in a bottoming process. 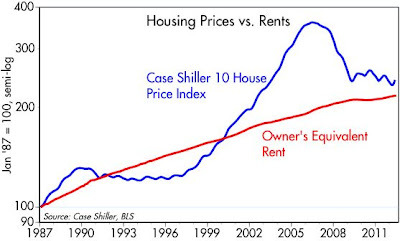 As this chart shows, house prices have increased only marginally relative to rents over the past 25 years. Since mortgage rates are at all-time lows, house prices are looking very attractive relative to the cost of renting. The "bubble" in housing prices has burst, and prices are now back down to reasonably attractive levels. 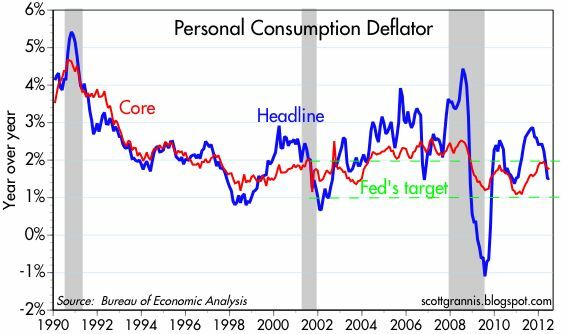 The Fed's preferred measure of inflation, the Core Personal Consumption Deflator, is up 1.8% in the past year, and it has risen at an annualized rate of 2.0% in the past six months. No sign here of deflationary pressures that would warrant further quantitative easing measures. 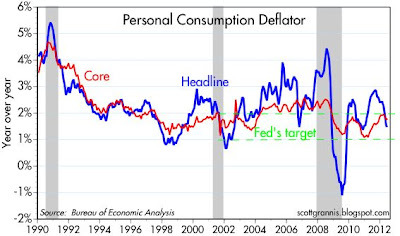 Indeed, this chart suggests inflation is right in line with the Fed's target. This chart disaggregates the personal consumption deflator into its three main components. What stands out is that durable goods prices have been falling for the past 17 years. 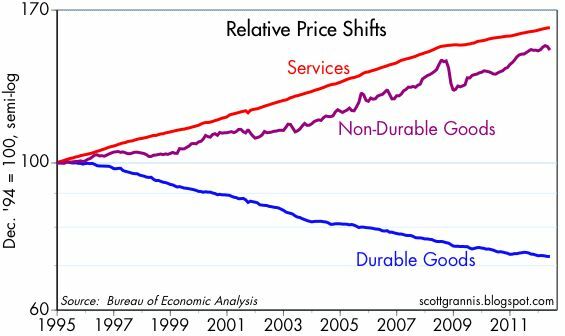 There is a lot of deflation in the durable goods sector, but this has been more than offset by rising prices for services (which are mostly driven by wages) and non-durable goods (e.g., food, energy). If you assume that service sector prices are a proxy for income, then incomes have risen by 120% relative to durable goods prices since the end of 1994. 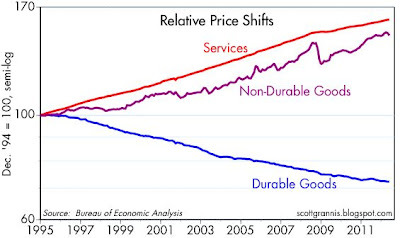 Put another way, durable goods prices have fallen by more than half relative to incomes. We've never seen relative price shifts of this magnitude. Ever. Not even close. Consumers have never had it so good when it comes to the purchase of durable goods such as computers, electronics, cars, etc. We can probably thank the Chinese and technological progress in general for much of this boon, since cheaper durable goods free up money that can be spent on other things. Worth noting: Some economists, such as Don Boudreaux of George Mason, have insisted that the CPI and PCD overstate inflation. They say this when reflecting upon the stagnation of middle-class incomes since 1972. If it is true that the federal government over-reports inflation, it suggest the Fed is targeting a too-low rate of reported inflation. We see the results of such an asphyxiation of our economy all around us: Depressed asset values (Dow at 1999 levels and property at 2000-ish levels), wage stagnation (unit labor costs are frozen) and extremely slow growth. Odd to say, the the menace to prosperity today is a slavish devotion to orthodoxies that are becoming past tense--that is when orthodoxy becomes dogma. Excellent summary Scott. Thank you for taking the time to post this (and all other posts).